Childhood. Just the word can ignite emotions — whether they be feelings of heartfelt nostalgia for “the simpler days” or immediate disdain for the immaturity and lack of control. Personally, I get a bit of both when recalling such a topic (which explains why I don’t do so very often), but that’s besides the point because what I’m going for in this introduction is not a loving walk down memory lane. Instead, I referenced adolescence for one simple reason — to bring up toys, which are an iconic staple of such times. Toys are more than just useless hunks of plastic; in fact, to children, they’re as valuable as siblings or at least close friends. That’s what’s so interesting about toys. But as we grow up, the “spirit” we gave our toys is slowly lost. We forget about the countless adventures that we shared with these multicolored pieces of mass produced plastic because as adults, that’s what we see the once fearless “Captain Jibba-Jabba” or “Princess Tomato-skin.” We see them as simple pieces of plastic. Toys act as a sort of portal into the adolescent psyche, but enough psychological mumbo jumbo (though I do plan on tying it all together in a brief minute), let’s instead talk about the hugely popular “Toy Story” series. Now I clearly remember seeing “Toy Story” for the first time. Unlike many, it wasn’t in a movie theater but instead in my school auditorium (rarely did I go to the movies in those days). 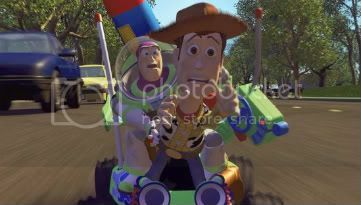 The first time that I shared an adventure, albeit a short one, with Woody and Buzz Lightyear, I was mesmerized. No, I didn’t understand a lot of it, but there was something about these characters that just drew me in and refused to let go. Then I watched the sequel, which had an even bigger impact on me. What an escape it was, so much so that I vividly remember crying about the fact that it concluded. Now, having re-watched both films, years later, I can admire them much more, although in a more technical sense, but the spirit is still there and it’s that spirit that made “Toy Story” and its sequel the classics they are today. Wow, I guess I threw out the whole “not going down memory lane” act pretty quickly. But since we’re back to talking about the present, I’ll once again start by talking about a review for “Toy Story 2” that I read on Rotten Tomatoes. The accolade read “Toy Story 3 has an extremely tough act to follow.” I wholeheartedly agreed and this is where the waiting game for the third installment of “Toy Story” began. But I lost no sleep over it. “Toy Story 3” would either be a classic or a failure and given Pixar’s almost sickening success rate, I knew it’d be a classic and it turns out, I was right. “Toy Story 3” surpasses its predecessors in both tech and storytelling, and director Lee Unkrich, who co-directed “Toy Story 2,” deserves recognition for once again summoning the same emotions in the audience more than a decade ago. With almost all of the classic cast returning, the long-awaited second sequel has Woody (Tom Hanks) and the gang sent to Sunnyside Day Care after mistakenly being donated. Of course, Buzz (Tim Allen), Mr. and Mrs. Potato Head (Don Rickles and Estelle Harris), Jessie (Joan Cusack), Rex (Wallace Shawn), Slinky Dog (Blake Clark — the replacement for original voice actor Jim Varney, who sadly died), Hamm (John Ratzenberger) and the aliens (Jeff Pidgeon) feel abandoned by Andy (John Morris), who is now 17 and going off to college. The toys take the chance to make themselves available to the children of the daycare so that they may be loved again. However, Woody isn’t so anxious about staying and not even a warming introduction by the resident Lotso (Ned Beatty), a pink teddy bear whose defining characteristic is that he smells of strawberries, can change that. Woody decides to escape the daycare in order to return to his rightful owner. But things aren’t as they seem in Sunnyside, and Lotso turns out to be a tyrannical leader, sending the gang to get ravaged by toddlers and then trapping them when they try to escape. I’ve always hated the antagonists in animated films. Most of the time, they have no reasoning for their actions and just act the part of the stereotypical villain because you need an enemy for the protagonist. However, Lotso is an extremely effective antagonist. The film clearly explains his actions and at times it’s heartbreaking to see him perform acts of depravity and deception because it’s clear that he is just misguided and overtaken by the thirst for control. But besides from the excellent addition to the cast, the returning characters are just as likable as ever. Woody returns with his signature loyalty, Buzz with his leadership and courage, Rex with his childlike immaturity, and of course, Mr. Potato Head with his signature brand of pessimism. The gang returns practically unchanged from the last time we saw them and this is one of the film’s greatest assets. But what about Andy? He, of course, has changed dramatically. This is due to clever storytelling. Just to think that we aged along with Andy makes it no surprise that most of the audience was high school/college age. But Andy has never been more than just a setup for the plot. However, this is where I return to the idea that toys are given personalities by their owners. In the very first scene of the film, we are re-introduced to the gang via a flashback in which Andy re-enacts a train heist with Woody trying to catch Mr. and Mrs. Potato Head before they run off with bags of stolen cash. All of the toys, though idiosyncratic, are part of Andy’s psychology — his goals, his aspirations, and maybe even some of his struggles. So I should say that Andy is the most important character of them all — even though he has the least screen time. “Toy Story 3” never loses steam and it pumps scenes after scene with human emotion at its purest — whether it is sadness or laughter. It goes out with a bang with the third act being one of the most thrilling in any film that I’ve ever seen and it features a last scene that just captures the essence of growing up so beautifully that many in the audience shed tears. Such onscreen magic can only be achieved by experts and expert work is what we get. The voice acting is impeccable and the writing is continuously sharp and imaginative and it is put together perfectly by masterful direction from Unkrich. “Toy Story 3” may be about the misadventures of a gang of toys but the range of human emotions and the resonance never seems plastic or manufactured and thus deserves to be see by everyone, young or old. It is a true masterpiece — and saying that it is Pixar’s best film is not far fetched at all. Note: It is recommended that all who do plan on seeing “Toy Story 3” pay for the regular screening and not the 3D, as 3D offers little to no more enjoyment and it’s just an added expense. Fun Fact: The original story of “Toy Story 3” had Buzz Lightyear’s toy model recalled and it was up to the team to save him from destruction. Luckily, the idea was shelved. Great review. I definitely agree with you. This movie was amazing. I was 8 when the first movie came out and I remember just being blown away by it. Now I’ve just graduated from college, and the themes of growing up, letting go and moving on really hit home. It was just a beautiful movie all around.